Can You Still Make a Living as a Photographer? Have photographs lost their economic value? It’s easy to connect the dots, from photo agency consolidation through digital image capture, the conjunction of crowd-sourcing with the World Wide Web and social media, to underserved publishers and the sorry circumstances challenging photographers trying to earn a living. Technology has made taking pictures effortless. No one has used technology to make the business of taking pictures effortless. The good news is that any trivialization of photography is not sustainable. Vital to every aspect of commerce, the demand for photography is enduring and universal. Its value is unequivocal for brands and media companies that publish pictures to communicate with their own customers. However, it is increasingly hard for them to find commercially useful pictures. It should therefore be clear that economic issues confronting photographers are directly related to issues of utility facing publishers. The question should be, Is photography underpriced? Approximately 120,000 photographers worldwide earn $6.5 billion in fees shooting contracted jobs for their own clients. It’s all fragmented. Not just revenue is fragmented, workflow is fragmented too. These are commercial photographers — the ones we call professionals. They shoot exclusively for commercial publishers. They have a hard time getting invoices out accurately and on time, and a harder time getting paid. At the same time, they produce $3 billion worth of residuals: photographs for relicensing after initial publication rights expire. This exclusive premium content is not monetized at all; not by photographers, not by distributors. Despite the fact that publishers prize this content, 90% of pro photographers categorically refuse to contribute it to the stock photo pipeline. Hint: In this industry, distributed inventory is a problem, not a solution. Blockchain is a feature, not a business model. The technology doesn’t address any issues that keep photographers up at night. Neither do curation or post-production image processing pose grand problems for AI to solve. Routine stuff. Creatives have bigger fish to fry. Cutting through licensing red tape, coming up wtih a fair price, and getting paid are topmost on the minds of photographers. The incumbent middlemen, having sidestepped innovation and organic growth to consolidate an obvious consumer-facing opportunity, cut photographers out of the value chain. Getty Images, in particular, didn’t so much disrupt the marketplace as buy it. There were consequences: the larger multibillion-dollar Enterprise-facing segment is now grossly underserved. Only when Enterprise and Retail are acknowledged as separate segments of a single market, with each segment serving a different class of customers, is it evident how one hand washes the other. What helps photographers helps publishers, full stop. A holistic approach is required to create a dynamically-curated source of premium stock photos that will satisfy Enterprise publishers by, first, making it easy for photographers to do business with them — when shooting commissioned jobs that is. 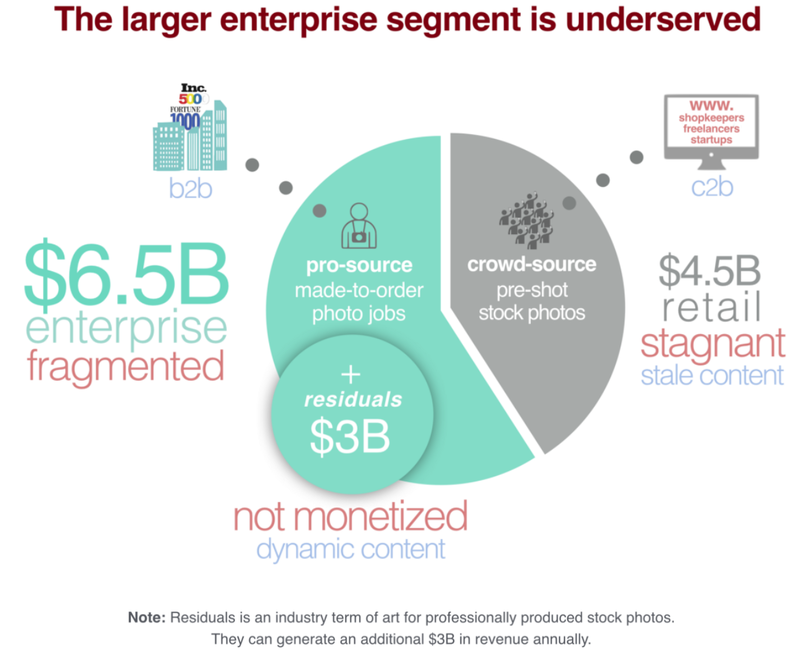 Enterprise publishers (buyers) are increasingly unhappy with stock precisely because photographers have a hard time navigating the world of business and shooting pictures at the same time. These are not separate issues. 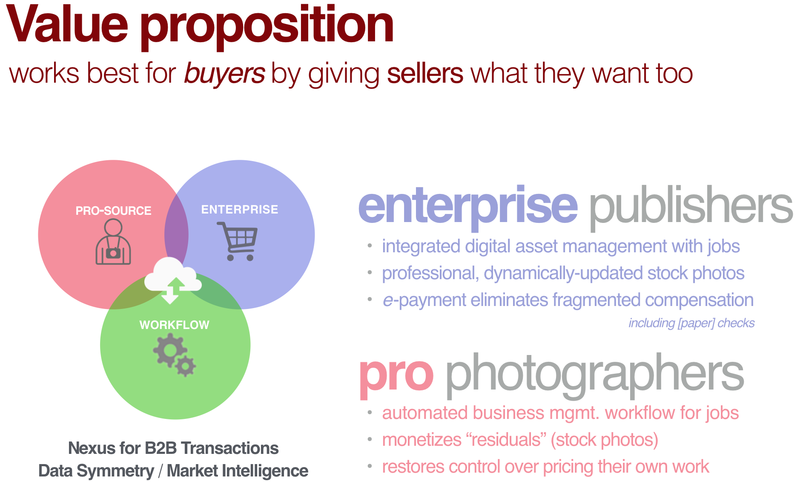 Moving the photographer-publisher workflow (B2B/business-to-business) away from desktop software and paper, and onto the Web and the cloud instead— not just for the sake of automation — makes actionable market intelligence available. That’s the real value. Maintain the seamless and timely turnover of inventory (i.e., the stock in “stock photo”). The further advantages of a consolidated holistic workflow prevent inventory bloat as well as the overuse of individual photos, thus protecting buyers’ brand identities. It makes prices sustainable for photographers and affordable for publishers. Only a platform connecting commercial publishers with the photographers they already trust and hire to shoot jobs can provide access to symmetrical information flowing dynamically between them. When the aforementioned market intelligence is combined with business automation protocols to facilitate transactions, all of a sudden it becomes feasible to seamlessly capture premium residuals for rights-managed stock photo licensing as a routine part of the interactive jobs workflow. 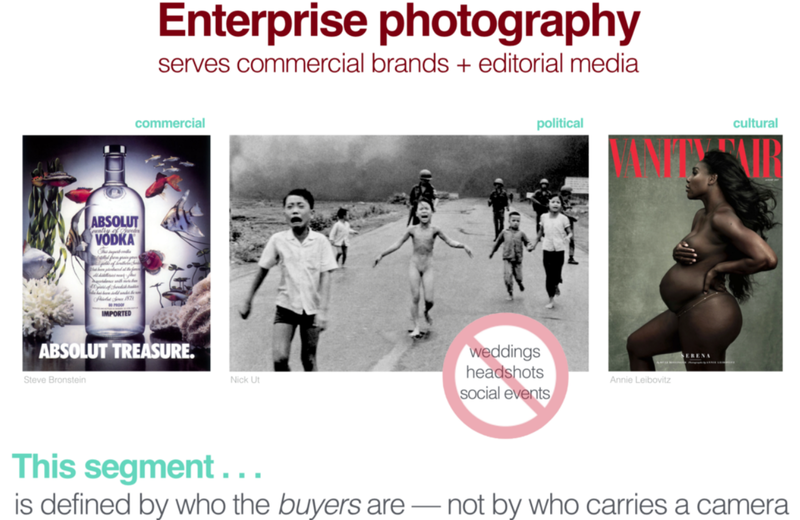 The broker maintaining this platform understands that photographers and publishers have equal standing as customers. Today, no company is monetizing either fees or residuals, let alone both. Thus, one broker, by leveling the economic playing field, will consolidate the worldwide community of pro photographers, to redefine the Commercial Photo marketplace, growing share and revenue across the board. The emergence of crowd-sourced, consumer-to-business (C2B) stock photo sales created a new customer segment: shopkeepers, freelancers, and startups that previously had no need to publish pictures, let alone the wherewithal to pay for them, and now need photos to fill up their Web sites. Middlemen stepped in to capitalize on this need. At first, Enterprise publishers got a windfall, paying the same cheap licensing fees for photos as retail consumers. But a crowd-sourced supply chain inevitably led to commodified prices for an increasingly bloated and stale inventory: photobesity. The incumbents believe that revenue is possible only through high-volume sales at low prices. That philosophy is belied by the fact that they are unable to grow revenue, despite an obvious increase in demand for photography. Their error was to recklessly lump B2B transactions together with emerging C2B sales into one bargain basement bin. That‘s why revenue throughout the industry is static. 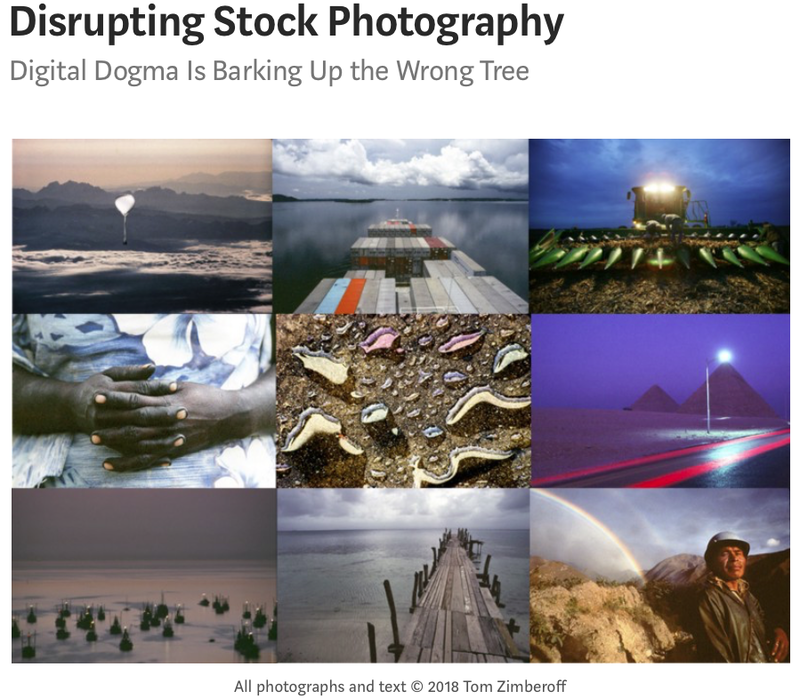 This seasoned photographer and founder is both astonished and bemused by investors who, time after time, apply the rules of conventional consumer-facing businesses to the steeply vertical Enterprise of commercial photography. Their failure to appreciate its idiosyncrasies — even for B2B — is the very reason an opportunity exists to disrupt it in the first place. This circumstance elicits a rhetorical but unapologetically indignant question: How many more times must the latest razzle-dazzle team of MBAs and Ph.D. engineers, with ZERO experience in photography, sing the same old song to credulous investors before they realize it ends on the wrong note — every time? Investors might be forgiven fortheir confusion because both the Commercial Photo and Social Photo markets use cameras as tools of their respective trades. Less pardonable, however, is their inability to differentiate between the two separate segments of the Commercial Photo marketplace. 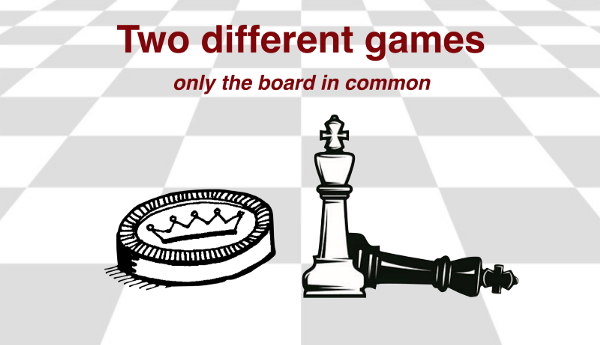 The differences between the Enterprise B2B segment (familiar to photographers and publishers, serving brands and media) and the Retail C2B segment (familiar to the public at large, serving shopkeepers, freelancers, and startups) are as profound as the differences between chess and checkers: two different games with very different rules, whose only similarity begins and ends with a playing board; just as any similarity between two profoundly different business models begins and ends with a camera. The upshot is, ironically, the most lucrative segment of the most literally obvious enterprise in the world lies hidden in plain sight. Big corporations, along with an aggregation of small companies, spend billions of dollars every year to make sure you see the photographs they produce every day, aiming to influence the commercial, social, and political decisions you make every day. This workings of this essential industry are invisible to founders and investors — consumers too. Getty Images bought its market share with no hands-on experience in photography. Their ignorance of the Enterprise side of the marketplace left a knowledge vacuum in the wake of their expansion through serial acquisitions of existing stock photo inventories, having sidestepped organic growth and technological innovation. To paraphrase Facebook’s CEO, if you move fast and break things, you have an obligation to fix them! Getty Images was always bullish about crowd-sourced photos. But they were the bull in the china shop, clumsily shattering everything valuable in sight. Many feckless startups — matadors, if you will — have dared to enter the china shop and pick up the pieces, only to be gored by the bull. Fixing a dysfunctional marketplace requires an acknowledgement that photographers own what they create, and that intellectual property ownership is the basis of value for industry-wide revenue. The most tried-and-true investment thesis is to take an essential industry that’s not digital and make it digital. Once photographers are networked with their existing commercial clients on a platform that uses market intelligence to faciltate rights-managed pricing, content curation is automated, pricing guesswork pricing and commodification are eliminated. The privacy of transactions and the primacy of intellectual property rights are respected. 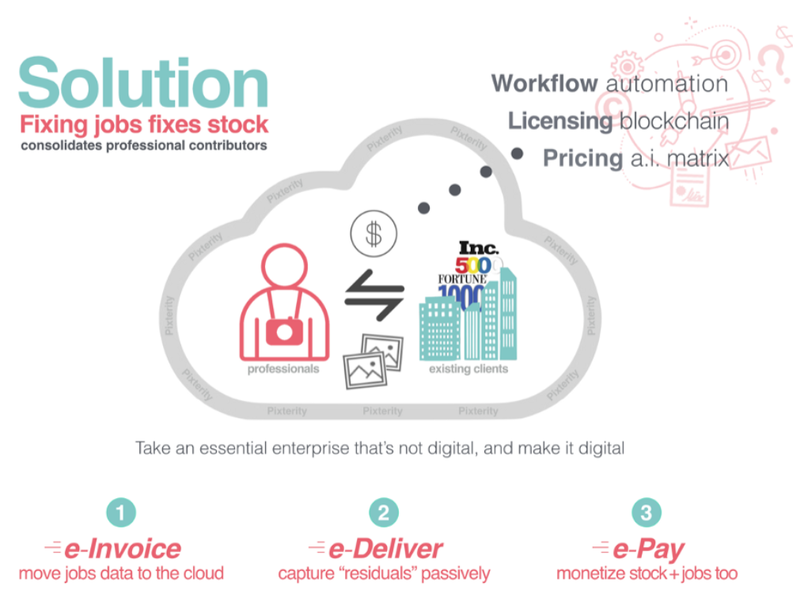 Complex B2B licensing transactions are simplified, including copyright contract composition; rights-managed pricing; predictive image search; federal copyright registration; digital asset management; electronic image delivery; e-billing; e-payments; and cloud image backup. It improves economic and creative outcomes for photographers, publishers, and broker alike. You’ve just read the short and sweet version. It was excerpted from a more detailed explanation about how to fix the dysfunctional photo business, also on Medium. Give it a read. As a photojournalist, I’ve covered hundreds of historical and breaking news stories. I’ve shot many hundreds of portraits, including magazine covers from John Lennon to Steve Jobs plus two sitting American presidents for the covers of Time and Fortune. I’ve shot advertising campaigns for Fortune 500 companies, Hollywood movie studios, and the United States Navy. My career-long body of work, shot on film, was acquired, for conservation and research, by the Briscoe Center for American History at the University of Texas at Austin. My prints are collected by museums, including the Los Angeles County Museum of Art and the National Portrait Gallery in London. I created PhotoByte®, the first successful CRM/licensing-and-billings software for commercial photographers. And I wrote the book about the business side of photography titled Photography: Focus on Profit (Allworth Press, 2002). It has been used to teach at colleges across the country. I founded a venture-funded startup during the Dotcom bubble, and, more recently, matriculated the StartX tech-company accelerator affiliated with Stanford University. I was also represented consecutively by two of the most esteemed photo agencies worldwide, Sygma and Gamma-Liaison, until they were acquired in the 1990s by Corbis and Getty Images respectively. I went to great lengths to remove all physical film and digital traces of my work from their two exchanges; but, despite my having forbidden them to license my work, I discovered they were still doing so — for insultingly paltry fees. In years past, I’ve received several very small checks in the mail from Getty Images for photographs I did not shoot.